Satu sistem untuk semua aplikasi, hingga 20 sensor. 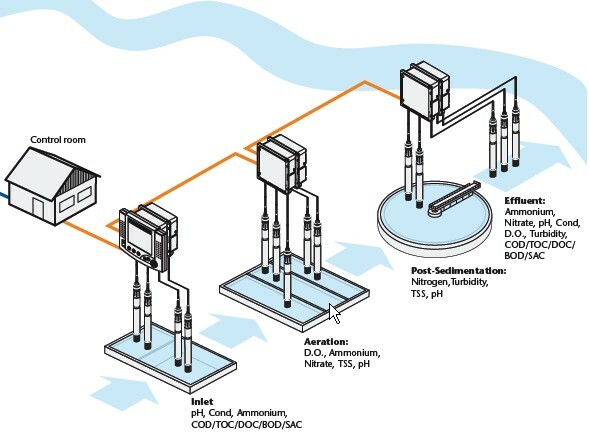 Multi-parameter: pH, DO, Conductivity, Turbidity, TSS, Ammonium, Nitrate, COD, dll. Sensor dapat ditambah / dikombinasikan sesuai keperluan. Plug and play; Sensor diidentifikasi dan ditampilkan secara otomatis. Semua sensor ditampilkan pada 1 display / controller. Display / controller bisa ditambah lebih dari 1. Redundant controller. Jika rusak, kontrol akan dilakukan unit ke 2 secara otomatis. Display / controller dapat dipindah dg mudah (mechanical docking). Internal data logger / recorder. Data dapat ditampilkan secara numerik / grafik. Download data ditampilkan dg Ms Exel. Data kalibrasi di dalam sensor, sehingga kalibrasi dapat dilakukan di ruang kontrol/Lab. Teknologi 2-wire dg signal digital hingga 1000 meter, bebas gangguan. Cukup 1 kabel (2-wire) terhubung dg ruang kontrol, meskipun banyak sensor. USB port dapat digunakan sebagai kunci akses. Tersedia input modul untuk membaca perangkat lain seperti Flow meter, Level dll. Auto voltage 100 … 240 VAC (50/60 Hz) atau 24 VDC. Protection rating IP 66; Equivalent to NEMA 4X. Detailed information on delivery contents, technical data, possible configurations and features can be found within our IQSN catalogue or flyer. Software supported routines for the safe data transfer from laboratory to online systems. Safe and easy allocation of online and laboratory measurement via job files and functions. Integrated help functions for correct processing. Check for completeness and plausibility. Complete reading of all data using one button without any interruption of the online measurement. 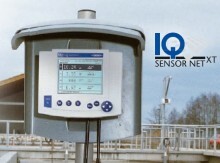 IQ-LabLink enables a save data exchange between the IQ SENSOR NET and the laboratory instrument. The exchange is processed via a common USB memory stick, serving as data medium between the Online system and the laboratory instrument. The condition is that both instruments feature this function and are equipped with a USB interface. The first WTW instruments to include this function are the two new spectrophotometers photoLab® 6100 VIS and photoLab® 6600 UV-VIS (laboratory instruments) and the terminal/controller MIQ/TC 2020 XT with access to the IQ SENSOR NET. When the Electronic-Key function in the IQ SENSOR NET system is activated, the USB memory stick works like an electronic key giving access to the system. A coded file is therefore stored on the USB memory stick. After reading the file access is activated to the system. It is also possible, to release only certain functions in order to personalize access. Click the button below to add the Controller / Transmitter 2020 to your wish list.